Never been skiing but this place would tempt even a wimp like me! Imagine swooshing downhill across ice-white powdery snow, sun beaming down out of a deep blue sky, with a backdrop of the highest mountain range in the world. You can do this at Gulmarg, one of India’s premier ski resorts, only 35 miles from beautiful Srinagar in the Indian state of Jammu and Kashmir. 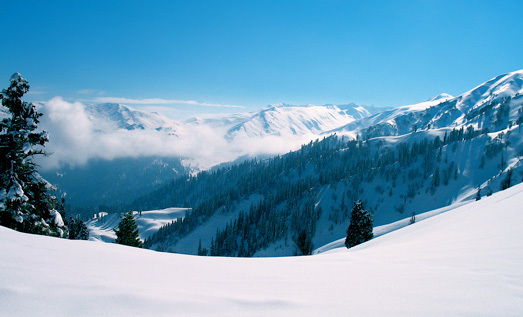 Skiing was introduced to Gulmarg by two British Army officers who established the first ski club at this hill station in the 1920s, but it is only in the past decade that this popular destination has really taken off as a first-class attraction for skiing enthusiasts. In the winter, the extreme and varied terrain combined with very heavy snowfalls, create a snow destination that is among the best in the world. In 2011 CNN voted it in the Top 5 Asia Ski Resorts.